Well known West River priest, Msgr. William O’Connell, 83, passed away Saturday, Aug. 29, 2015, at his home, Casa Maria, in Piedmont. He was born Sept. 8, 1931, to Maurice and Helen (Foley) O’Connell of Chicago, Ill. Msgr. O’Connell attended St. Gall Parish School for elementary education and Quigley Preparatory Seminary for secondary education. He attended St. John Seminary, Little Rock, Ark., and St. John Seminary, Collegeville, Minn.. His ordination to priesthood for the Diocese of Rapid City was held May 12, 1957. At the request of then-Bishop Charles Chaput, Pope John Paul II appointed him a monsignor in 1995 and in 1998 he was appointed Episcopal Vicar for the northern deaneries by then-Bishop Blase Cupich. As a priest, he served the diocese in many capacities including vice chancellor, chancellor and consultor. He was a member of the Marriage Tribunal, the South Dakota School of Mines & Technology Newman Center Chaplain and chancellor, and a Newman Center Chaplain for Black Hills State University. From 1971-75 he was the diocesan director of the Catholic Campaign for Human Development. At the request of Bishop Harold J. Dimmerling, following the Rapid City flood, he started Catholic Social Services in 1972. Again at the bishop’s request, in 1973 he founded the diocesan newspaper, West River Catholic. He served as editor from 1973-78 and was Associate Editor from 1978-2012. He wrote a monthly column, “Common Ground” until he retired from the newspaper in April 2012. He wrote articles for several magazines and a book on Catholic heritage. Other service to the diocese included terms on the Clerical Aid Board, Personnel Board, and Priestly Life and Ministry Committee. 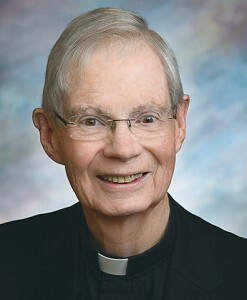 He was instrumental in the We Walk by Faith Special Appeal committee and Terra Sancta Guild, which raised money to renovate the former Benedictine Monastery in Rapid City into a retreat center and parochial school as well as raising money toward building new Newman Centers in Rapid City and Spearfish. When Bishop Dimmerling died Dec. 13, 1987, then-Father O’Connell became diocesan administrator until Bishop Chaput was ordained July 26, 1988. He served parishes in Spearfish, Kadoka, Wall, Gregory, Burke, and on the Standing Rock Reservation he served rural parishes as part of a pastoral team at McLaughlin, Bullhead, Wakpala, Kenel, and McIntosh. He was part of a committee that helped with the transition from the Sacred Heart Fathers to diocesan priests on the Cheyenne River Reservation. In Rapid City, he served at St. John the Evangelist Church (now St. Therese the Little Flower Parish), Blessed Sacrament Church and was the rector of the Cathedral of Our Lady of Perpetual Help. Locally, he was a member of the Board of Directors for Crazy Horse Memorial, Custer, and West River Mental Health Center. He served on the Investigational Review Committee for Black Hills Eye Institute, Rapid City. In the early 1970s Msgr. O’Connell served on several civic committees and commissions — the Mayor’s Racial Reconciliation Commission, Crossroads Drug Center, and Church Disaster Response. At the state level he was a founding member of the Association of Christian Churches for South Dakota. Nationally, he was an advisor to the National Council of Catholic Bishops, a member of the President’s Committee for the Elderly and a member of the National Catholic Aids Network. He was a Church World Service consultant from 1973-83; a consultant to the Niagara Task Force — Love Canal, response to hazardous wastes; and a member of the National Catholic Charities Board of Disaster Committee. Msgr. O’Connell was a writer and a producer of a television program, “Void of Desolation,” an educational show about hazardous and toxic wastes, and he developed a training seminar for disaster workers. He was named a Distinguished Citizen from Rapid City in 1965, 1970 and 1973. He received the Liberty Bell Award from the Pennington County Bar Association in 1975; and the Outstanding Service Award from Black Hills State University, 1984. He was given the first Founders Award from Catholic Social Services in 2010 and in 2013 the new CSS building was named for him. He retired to Casa Maria Priests Home, Piedmont, in 2002, but continued to assist in parishes and at St. Martin Monastery as needed. He was preceded in death by his parents; and brothers Fr. Maurice O’Connell and Thomas O’Connell. He is survived by his sister, Joan (William) Hickey, Chicago; sister-in-law, Elizabeth O’Connell; 12 nieces and nephews; 13 great-nieces and nephews; and one great-great-nephew. Christian Wake Service was held September 2 at the Cathedral of Our Lady of Perpetual Help, Rapid City. Christian Funeral Mass was September 3, at the Cathedral, with the Most Rev. Robert D. Gruss, Bishop of Rapid City, presiding. Interment is at St. Martin Monastery Cemetery. A memorial has been established to Catholic Social Services. Osheim & Schmidt Funeral Home was entrusted with arrangements. His online guestbook is available to sign at osheimschmidt.com.